The Agro-Industrial Park of Bukanga Lonzo (PAI-BL) is the first complex intended to transform DR Congo’s agriculture into an engine for economic development. When completed, the PAI-BL will have over 50,000 hectares of developed farmland producing staple crops and vegetables. It will also produce livestock products such as poultry and pork. the SARD-SC project funded by AfDB. In addition to producing food, the PAI-BL will bring with it infrastructure required for agricultural development such as roads, power, and water. Smallholder farmers living in and around the PAI-BL will have the opportunity to take advantage of such infrastructure to develop their own agricultural activities to increase income and improve livelihoods. IITA is committed to increasing the capacity of the smallholder farmers by putting at their disposal technologies that will enable them to increase their productivity, improve the quality of their produce, and add value to it so that it can be commercialized through the PAI-BL or directly to the market. The IITA station in Kinshasa together with various partners have ensured that smallholder farmers received cassava planting materials from high-yielding improved varieties such as the Obama (TME 419) and technical support that has enabled them to use best agronomic practices for high productivity. Based on the good agronomic practices used by farmers and the genetic potential of the variety, yield is expected to be around 20 t/ha. It is expected that farmers’ production should be around 3,000 tons of fresh cassava tubers. Working on a 300-day per year basis, farmers would need to have a capacity of harvesting and processing 10 tons of cassava per day . A cassava processing center will be established inside the PAI-BL to add value to farmers’ produce and for use as a demonstration and training center for IITA Youth Agripreneurs. The processing center will improve the quality of processed cassava products, and reduce the time needed for drying and postharvest losses. Staff members from IITA and the International Food Policy Research Institute led by Ir Simon Lukombo and accompanied by the Niji Lukas team of engineers visited PAI-BL to install and test the Niji Lukas cassava flash dryer. The flash dryer was successfully installed and tested using 500 kg of fresh cassava tubers harvested by local producers. 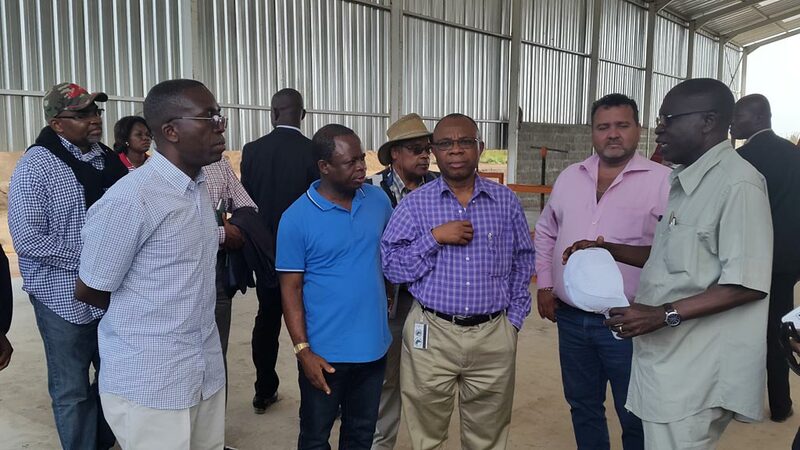 Prior to the flash dryer installation, on 8 May, Chiji Ojukwu, Africa Development Bank’s (AfDB) Director of Operations, escorted by Matata Ponyo, DR Congo’s Prime Minister, paid a visit to the cassava processing unit. The purpose of this mission was to identify the progress made in constructing this facility and to look at the integration of small and medium-scale producers in agro-industrial development. The DR Congo government and AfDB are negotiating partnerships for completion of PAI-BL.